I baked a "farewell summer" pie – I am that sad. I used really sweet, short & fat peaches because their harvest stops at summer’s end. I thought this would make the pie sentimental, especially for summer, because thats completely normal. I bagged 6 of these for £1.86 in the Turkish Food Centre! I went to WholeFoods where they were charging 2 for £1. The choice was simple. Summer, it was nice while it sort of lasted. 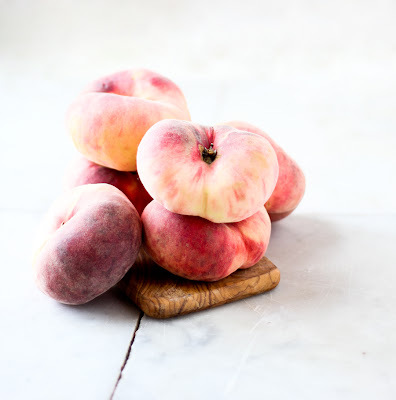 Once peeled back, the meat of this kind of peach looks under ripe, all pale and white in colour, when in fact, the taste is sweeter and juicier than your average peach. All that extra fructose can only mean one thing: tossing the pie filling in less sugar, and seeing as it’s Christmas soon we want all the extra waistline we can get. Once the sweet peach liquid and brown sugar combine a lot of excess juice turns up, this is ideal for a normal pie but catastrophic if its deep filled. To avoid too much fruit juice aiding to a soggy pie bottom, I used a tiny bit of cornflour and a tiiiiiny bit of sugar. This pie has 2 aims: Number 1: (Read: filling pickers only) To not make you feel as guilty. Number 2: To refrain from coming out of the oven looking like it’s pissed itself. If this pie wasn’t decorated with a shoddy lattice top (don't act like you weren't thinking it! ), I reckon it would just look like a savoury hot water crust pie. I took inspiration from Sprinkle Bakes’ berry deep filled pie and was at first dubious of using what is essentially a cheesecake tin, to bake a pie in. I had this slow motion mental image of releasing the cooled pie from the tin using the metal leaver only to be left with a puddle of peaches at my feet. Thankfully, the only things at my feet were a pair of shar-peis. All in all, peach pie is a weird and wonderful thing. Most pies are associated with sour fruits, take apple and cherry for example: they both leave you with a tangy aftertaste – perfect for a sweet-crust pie enrobed in custard, innit? 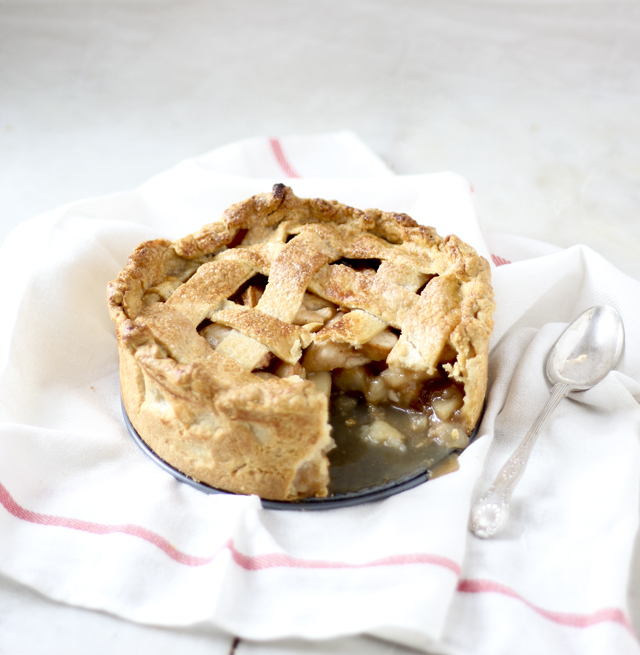 Well peach pie is a bit different, because there’s absolutely no tangy after taste, just honey-like sweetness. I’m not saying that I would recommend gravy with peach pie as opposed to custard, but it would probably make the experience a whole lot less sickening. 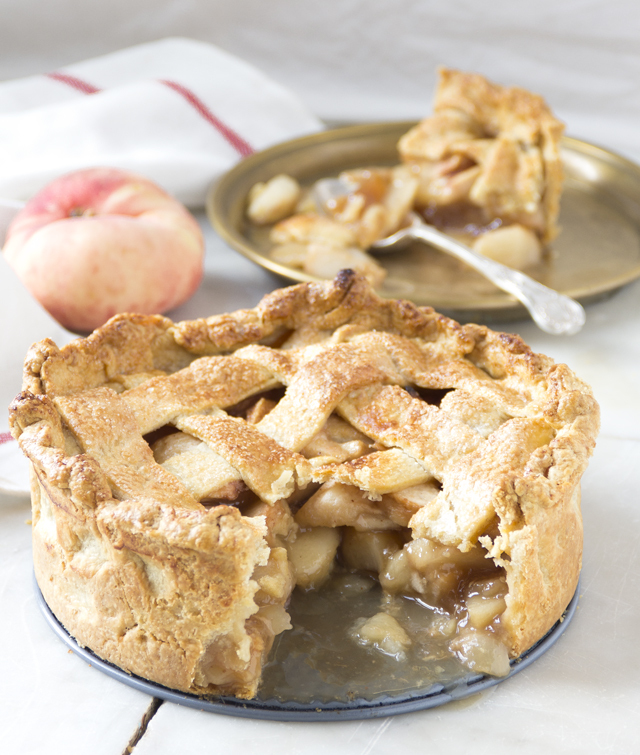 To avoid draping pie in gravy, stick to a savoury short crust with your peach pie. I would like to leave this poorly written post with this piece of information: a peach is just a hairy nectarine. Start with the pastry. Place a large bowl in the freezer just to keep everything cool. Cube butter. Take bowl out of freezer and sift in flour. Add butter and rub the flour into the butter with fingertips until you have what looks like breadcrumbs. Make a well in the centre, pour in water and egg. Take a knife and mix the liquid in with flour until a dough barely forms. Dump mixture on surface and lightly knead into a flat disc. Cover with plastic wrap and refrigerate for 30 minutes. Cut the pastry in thirds. Place 1 third back in the fridge. Roll the dough out into a 13/14 inch circle on a floured surface. Carefully lift dough by wrapping around rolling pin and place in the centre of tin, lift sides up to get rid of creases. Do not trim the pastry at this point. Place in freezer. Make lattice strips. Roll out the remaining third into a 10 each rectangle. Use a ruler to make several 10 x 1 inch strips. Place in fridge. Immerse peaches in boiling water for 3 minutes to help peel back the skin. Dice peach into squares/cubes/triangles and place in large bowl. Add lemon juice, making sure to coat each piece of fruit. Add sugar, cinnamon, nutmeg, salt and cornflour. Mix until a brown liquid appears. Preheat oven to 190 C. Fill pie with peach. 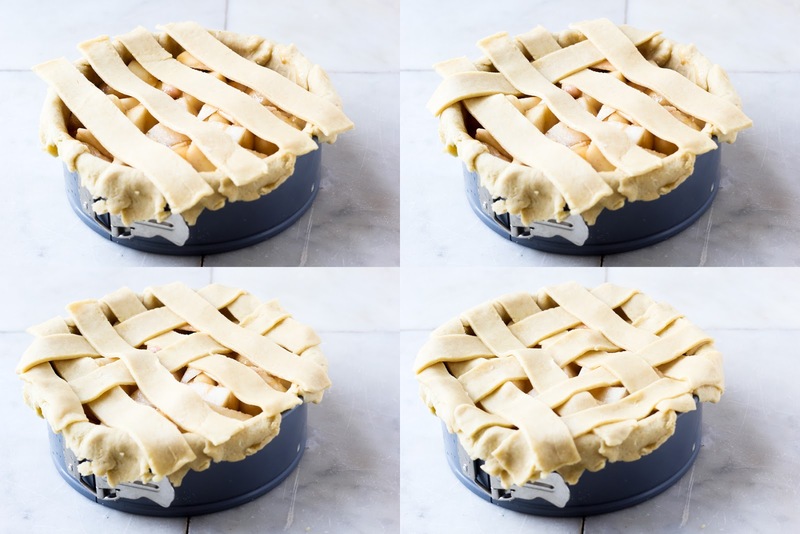 Place strips over pie to form a lattice by weaving one strip into the other. Cut off all excess and pinch the lattice strips and the pie crust together to form a decorative boarder. Brush top with egg wash and sprinkle with sugar. Bake for 20 minutes then reduce oven temperature to 175 C. Bake for 30 minutes then reduce oven temperature to 150 C and bake for 15 minutes longer. Leave pie to cool in tin for 2 hours. Remove from the tin and leave to cool completely overnight before serving, if you wish! Pie will keep for 3 days. A peach tree did not sponsor me to write this post. OH OH OH. Check this out. Rodda's - pretty much the only company in England who seem to have caught on with the clotted cream thing (cast your mind back to the cream aisles in supermarkets), have asked me do some guest judging! Over the coming months I will be choosing mah fave puddings on Insta, and the lucky winners will receive loads of fatty not good for you and creamy Rodda's related stuff in the post! Just hashtag ya puds with #Crownyourpuds and you're in!!!! 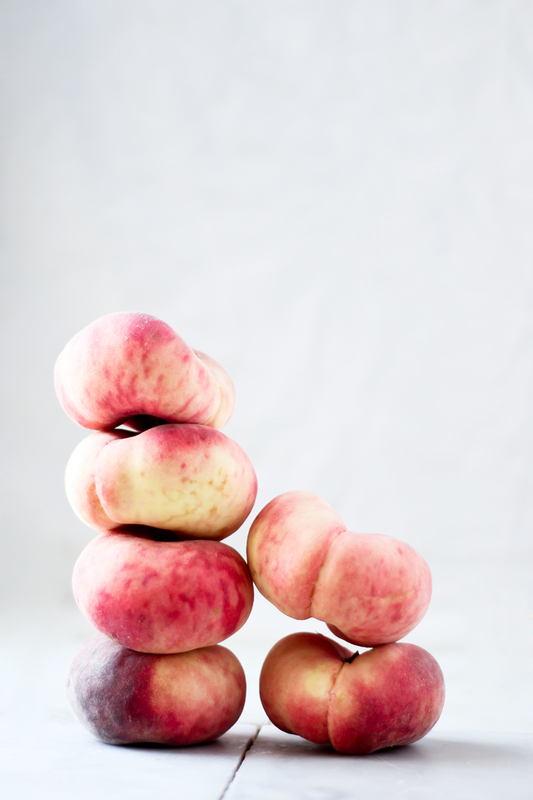 I love flat peaches, the tiny stones make for much less mess when eating. Plus super sweet and their deformed-squat shape makes me feel a bit sorry for them on the shelf next to the normal peaches. I can't not but them. I always use loose bottom cake tins for deep dish savoury pies but never for sweet. I must rectify this. soon. Deep dish pie....how have I lived without this for so long? I have to give this a try! Yours is not only pretty, but also kind of making me drool. Those flat peaches are so hard to come by around here (except at Whole Foods of course, but I don't want to pay those prices!) so I am going to have to make one with regular peaches. Or maybe apples! Small stones?? Oh Nelly, it was so so difficult to peel around those bloody stones! I love their look too, the difference between a flat peach at the supermarket compared to Wholefoods is crazy, the supermarkets variety was tiny! I think this pie would taste amazing with ordinary peaches too Nora, maybe up the sugar in the pastry if you were to use normal as the peaches aren't as sweet. I dont blame you, its so expensive in there and I have no idea why, considering its basically an organic supermarket, they have no excuse!! 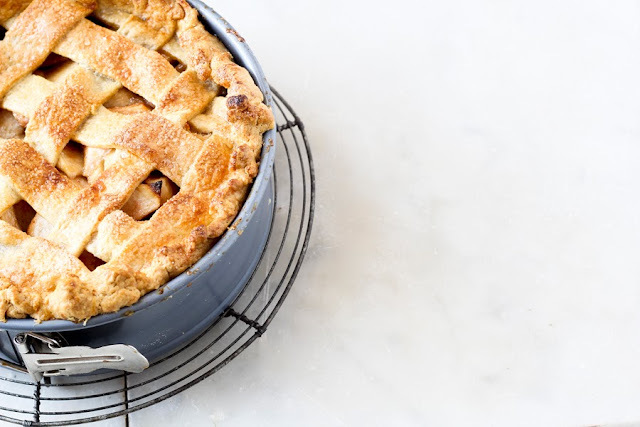 What a gorgeous pie and I so love the idea of baking it in a springform pan! 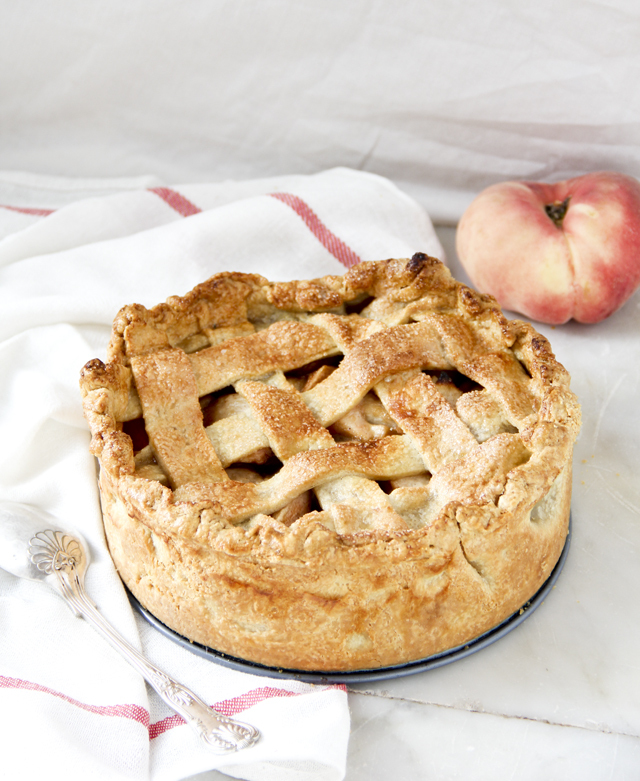 We just moved into Spring and I can't wait to get hold of some juicy peaches to make this pie! Lucky you, we're approaching autumn, can really feel the bite of it! Peach pie is the queen of all pies. And I have to say that I love your wonky lattice top. It has a pretty rustic look to it. And deep dish!! I love it so much! Your pics are incredible, as is the recipe! Going to go back and retag some of my pics now! I assume it will work in the comments? I love the look of this pie! What a clever idea to put it in a cheesecake tin. That is brilliant!